EasyHelper is a class and templates, allowing you to add a context help into the Clarion application. You can call context help by pressing the [?] button in the upper-right corner of you form window, or by right-click on the form control. Calls context help from the .HLP file. This is a classic Winhelp - standard Windows help format that can be viwed on all Windows versions, from Windows 3.1 to Windows XP without additional tools. Calls context help from the .CHM file. HTML Help - is the default online help format for Windows 98, Windows ME, Windows 2000 and Windows XP. Older Windows versions (Windows 95 and NT4) require the MS HTML Help viewer. In most cases, this viewer is already installed, because recent MS products include it. You don't need any external help file at all. The context help info is stored into the application. You can apply one type of context help (WinHelp, HTMLHelp or LazyHelp) to the whole application, or use different types in each procedure. Also you can assign a standard windows help to some of the "standard" controls like OK and Cancel buttons. With the help of the templates you can create projects for .HLP or .CHM help files, then run the batch file and receive the compiled help files without any extra HAT (Help Authoring Tools). All you need is to have on your PC a MS Help and/or MS HTML Help compilers. They are free and you can obtain them from Microsoft site. This package includes Class Libraries and Templates, demo app and documentation. To implement HTMLHelp or LazyHelp types of context help, both the developer's and user's system must support the MS HTML help (support to HTML help comes with Internet Explorer 4.0 and higher and included in Win98 and higher). 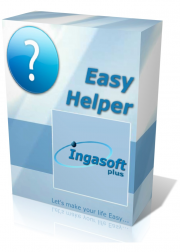 Also, if you want to make a help project by EasyHelper templates, you need 32-bit MS Help Compiler (.HLP files) and/or MS HTML Help Compiler (.CHM files), installed on the developer's PC.